StockFetcher is my preferred online stock screener. StockFetcher is a web based, end of day US stock screener. Looking for a specific pattern to trade? You can easily program this online screener to find just about any pattern you can think of. Featured are a number of pre-built screen categories. For instance, if you are looking for a specific short term candlestick chart pattern, there are about 40 pre-built candlestick pattern searches which you can select. One of the great features of this website is that you can quickly search for any type of stock you want. For example, the text below is for a simple stock filter which looks for rising stocks between $1.00 and $10.00 where the volume is at least five times above the average volume and above 1000000. The video below shows a number of different ways to get into the market. Once you know how to program StockFetcher you should be able to build a number search filters that can find any type of set up you are looking for. Evaluation or free level - Anyone can access the free stock screener however, the data is 10 days old. This level of subscription also limits the features that you can access however, you can still build an excellent watch list using this level of subscription. Standard – This level cost US $ 8.95 per month or 24.95 for three months. It gives you access to all of the features of StockFetcher except the advanced filter support. You can backtest your ideas, build watch lists, go back in time, save up to 100 filters and get email alerts. Advanced - This level cost US $ 16.95 per month or 44.95 for three months and gives you everything the standard version does except you get more of everything as well as support at this level. These levels of service can easily be compared by following the link on their home page. The ability to quickly write a filter which will identify any idea I have. The one feature which StockFetcher does not currently offer is the ability to screen Canadian stocks. To demonstrate how you can use StockFetcher as a free stock screener to build a watch list go to their home page under the Help section, select Example Filters and you will be taken to a page containing a number of their predefined screens. As an example, on May 2, 2006 using the 52 week new high search and limiting the stock price to between 10 and 20 dollars, CTCI was identified from among 61 hits. 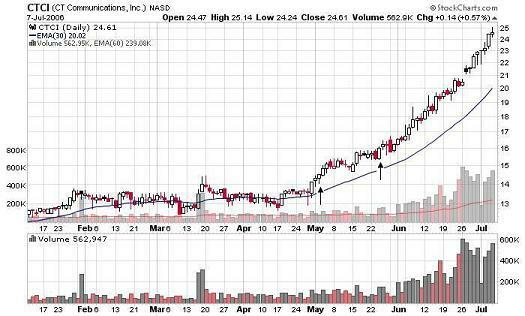 This stock recently broke out to a new high as is shown below. One advantage to using 10 day old data is that you quickly can identify the stocks that are weakening. After watching the stock for a while you may have seen that on May 24, 2006 it broke out of a short term consolidation pattern on above average volume. Had you picked it up at the open the next day it would have returned a respectable profit. Caution: this is a hand picked example to demonstrate that using StockFetcher as a free stock screener can aid in your stock selection. All picks will not turn out this well. Another nice feature offered is the ability to look at all of the sectors and industries and see how they rank compared to each other. Right from the home page you can look at the sectors and industries and quickly sort the strongest or weakest ones by last day, week, month, 3 month, 6 month, 1 year and 2 year. This is a very visual table and will quickly give you an idea of where the money is flowing. Once you have found the strongest sector or industry you can identify the stocks which currently have the highest or lowest volume, closing price or percent change. This is a fantastic tool. Their home page features technical screens such as Bollinger bands, MACD, RSI, Stochastics, DMI, Williams %R, Money Flow Index, OBV, ATR, CCI and Chalkin's volatility. There is also a pattern matching service which will match the pattern of a specific stock and show you other stocks with very similar patterns. For instance, if you identify a stock breaking out of an ascending triangle pattern, just input the symbol and other stocks having a similar break out pattern will be shown. Depending on whether you are using technical or fundamental analysis to search for stocks, there is a stock market screener out there for you. Try a number of them and find one that works for you. PS - As a full disclaimer, after almost 10 years of quality service, I stopped using StockFetcher. It is still a great tool and I really enjoyed being able to quickly put my ideas into code and screen for specific setups. I have moved off line and purchased AmiBroker. AmiBroker costs more than StockFetcher and you have to download your own data, which may cost you depending on the vendor you choose. There is also the data maintenance now which I did not have with StockFetcher. If you are looking for a good online stock screener, I would still recommend StockFetcher. 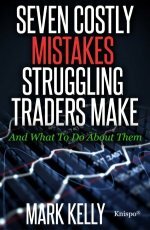 I have also found that learning about the number of loses one is willing to take while trading a particular trading system to be quite useful. Find out how I use the Monte Carlo Simulator for Traders to improve my trading.